You will see examples where not only living room and bedroom zones are in a tiny room but also a small corner for work and dining! 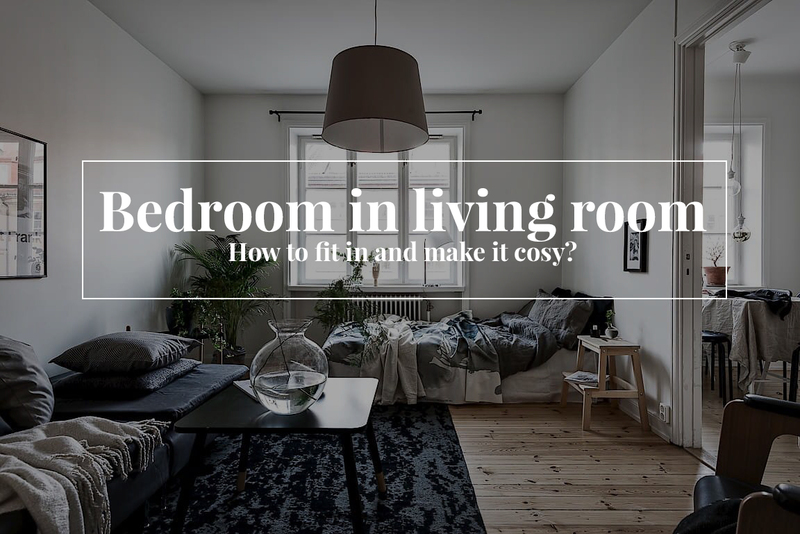 If you are living, renting or are equipping the flat for a rent where a separate bedroom is too big luxury this post is exactly for you! 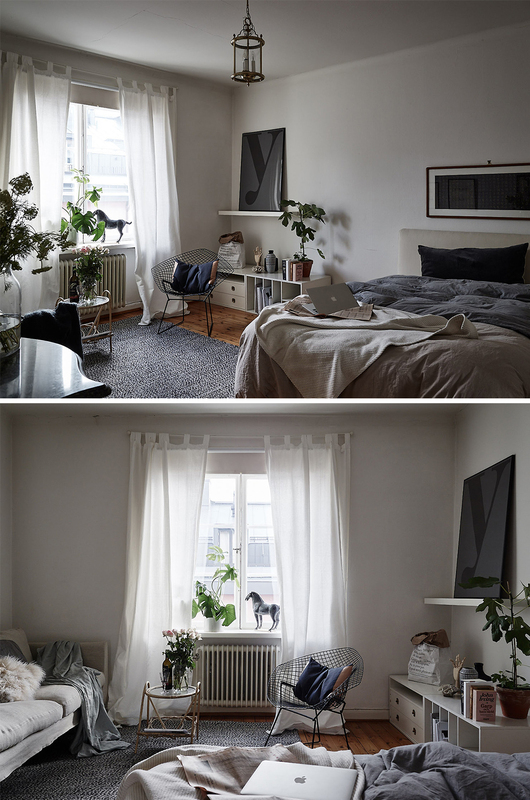 How to place two or even three different zones in one room so that they matched between and the room wouldn’t look overloaded? You can take ideas and examples from Scandinavians - they are masters in this area. 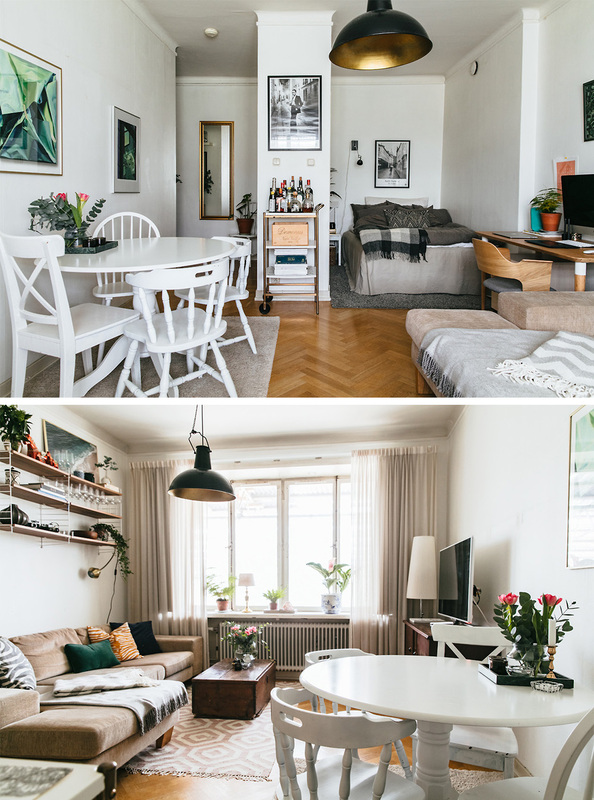 You will see examples where not only living room and bedroom zones are in a tiny room but also a small corner for work and dining! Of course, you’ll have to forget a corner sofa and a large double bed. 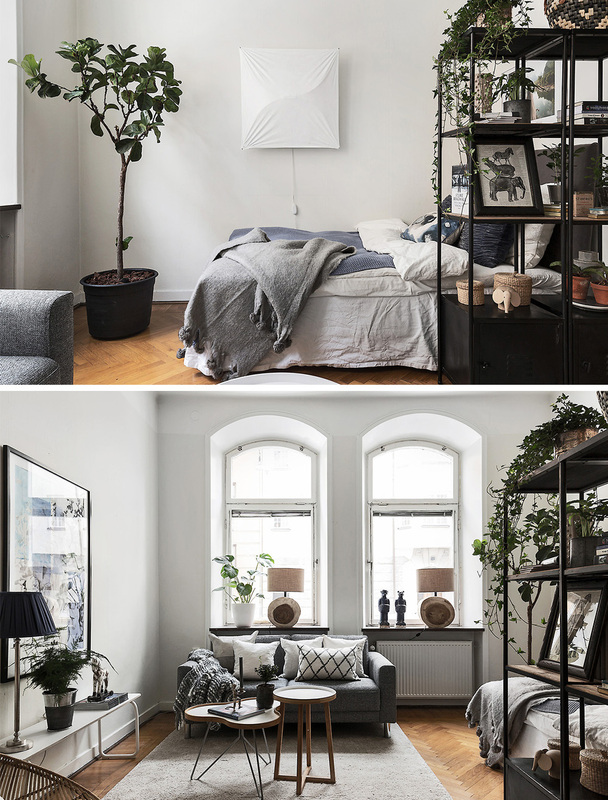 If you’re already trying to place several zones into one room choose a 160-centimetre-width bed (where, by the way, two people fit in) and two-place or three-place sofa. I can confirm that in 99 cases out of 100 the corner sofa won’t fit in and if it fits in it will make the room look visually and physically small. You’ll probably have to get rid of the closet, too. It should be somewhere else: in a hall or in a separate room. It’s only in case it doesn’t fit in the living room. 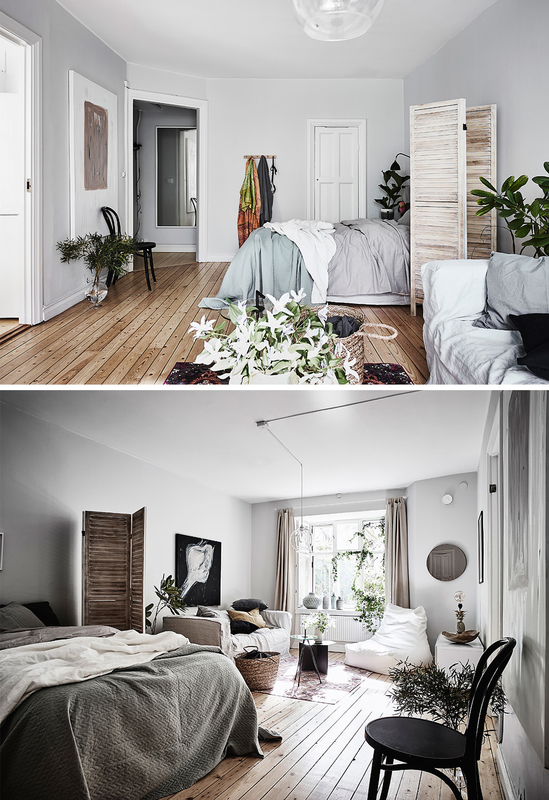 I was trying to select such examples where not only the bedroom zone but also more zones - it's always interesting to see how all zones look in one area. The element which unites all interiors – white or another light colour and no wallpapers. 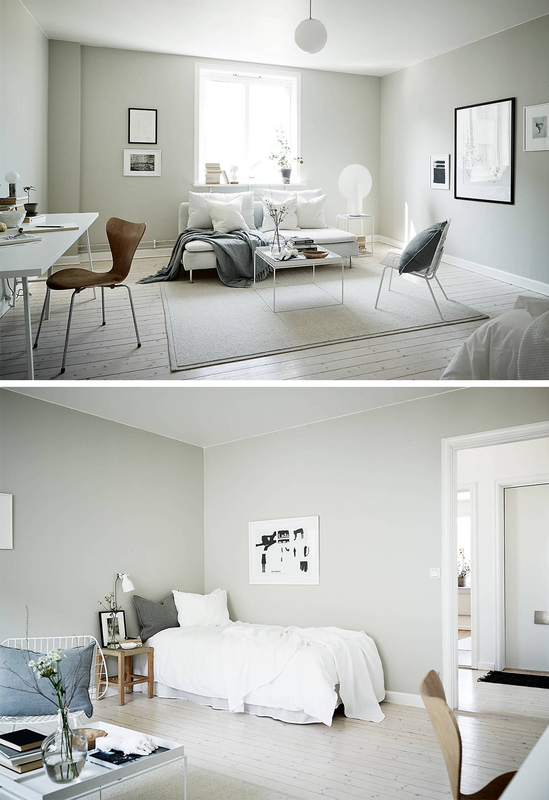 Posters and pictures are used to decorate walls. That‘s completely a perfect way to separate two different spaces. As far as the partition is short, the room doesn‘t decrease optically and one doesn‘t lose so much light as he would lose if he was building partition to the ceiling. The top of partition can be used as a shelf and if you add some hooks – as a mini cloth hanger. For those who like a bit romantic image a wooden screen would help to solve a privacy problem. When it‘s folded it doesn‘t take so much place and doesn‘t spoil the view and when it‘s extended it partly covers a private zone – it particularly helps when there‘re guests. I‘ll probably tell nothing new. Open shelves are frequently a rather usual solution which partly separates the spaces. 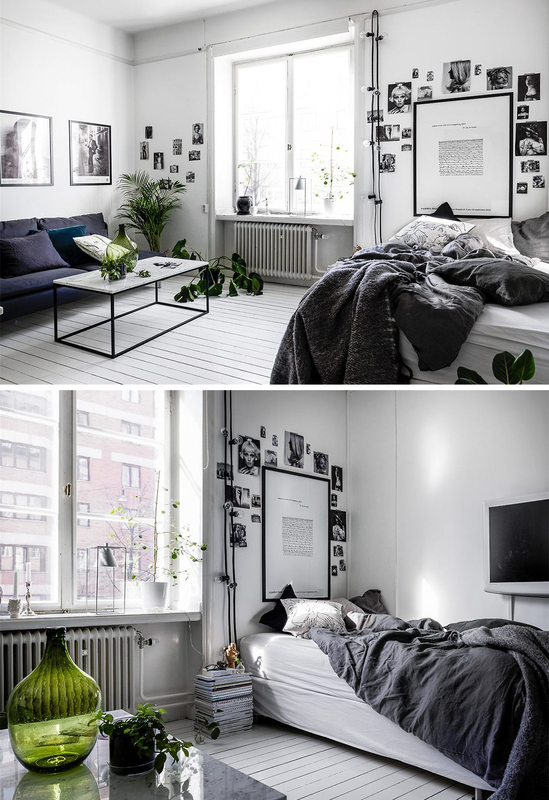 In this case, that‘s black frame shelf and when you fill them in with different accessories a bedroom zone is a bit covered. The latter can serve as an additional place to seat the guests, as the guest zone is extremely close. It‘s obvious that the interior has been established inexpensively. An open book shelf plays a partition function, but it‘s covered with the fabric and a bedroom is completely hidden. It seems that a shelter wouldn‘t keep the weight of the TV even though the place has been foreseen for this but as an idea it‘s worth attention. A solution which looks extremely cozy. 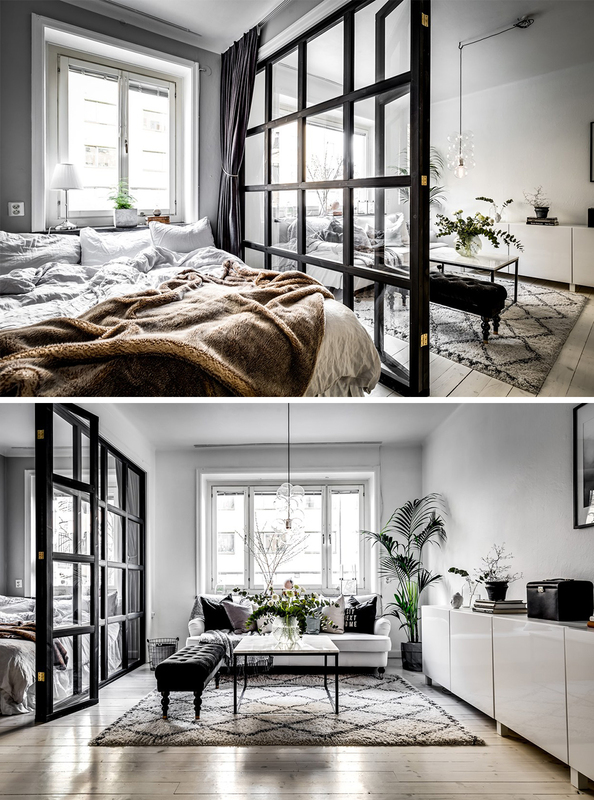 Such partitions in black frames is a really popular solution and if you want more privacy you can use curtains! If you have a suitable-dimension niche left in a space you can completely use it for a bedroom zone. It can be closed with curtains or a glass partition or you can leave it open as it‘s here. Pay your attention that even 4 zones fit in this room: a bedroom, a guestroom, a dining room and a work zone. That‘s the most risky but the simplest solution. Probably that‘s clear why the simplest? And how about the most risky? 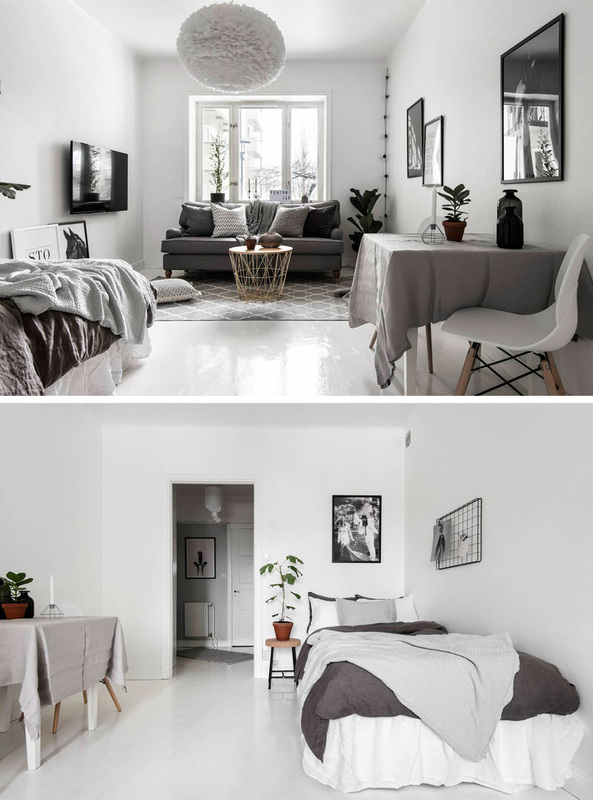 A bed always has to look nice, combined with sofa and textile which‘s used in a room and one must have a sense of style for this and constantly clean up rooms. 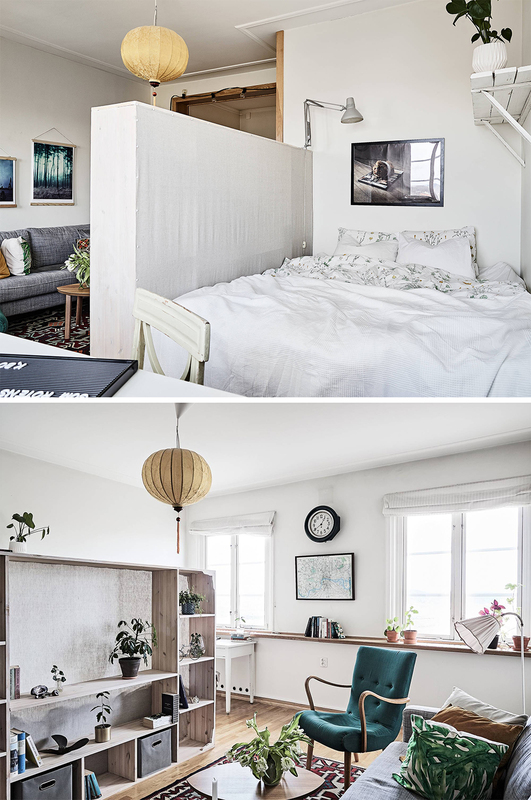 As you‘ve probably noticed Scandinavians like using textile very much and the interior still looks easily and, of course, cozily. 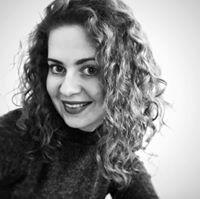 Hello Evelina, my compliments for your article, it was really interesting. For some months of the year I live in a studio apartment, our kitchen is in the entrance (sort of separated, but not so much!) and we decided to leave the space open, organizing different zones for bed and closets, living space and dining. I guess the choice depends on the layout. I was on Pinterest looking for some decoration ideas, and I enjoyed also to look at the pictures. So, at the end I was surprised that the comment was in Lithuanian, such a coincidence! My husband is Lithuanian too, he is an architect and he gratuated in your same Akademia in Vilnius. Considering that today is Dec 31, Happy New Year! It would be really interesting to see your space!